Hi, everybody! 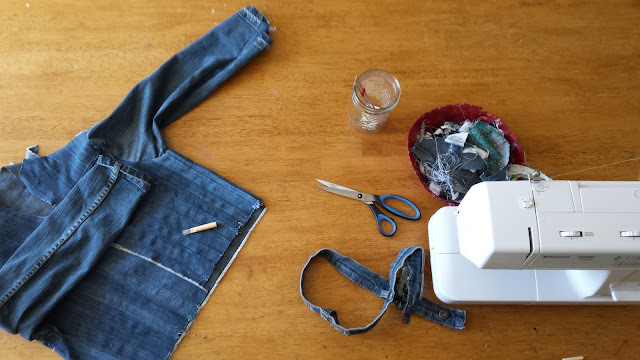 This is my first post on refashion co-op which I am so proud to be a part of, it was only a few years ago that I would come to this site to find inspiration and to teach myself to refashion. Which makes it so cool that I'm posting on here now. So who am I? I'm Natalie, I love sewing and refashioning and talk about it on my blog naterjane. I'm still learning, and not all my projects work out but I having a blast making unique clothes for myself. But let's get to the refashion, shall we? I'm a terrible person and don't as before pictures as this was before my blog. I made this jean jacket about a year ago. I had a lot of old jeans which I wanted to refashion but had a hard time finding an idea that would work. Not all the jeans were my size and most had stains or holes which most ideas didn't take into consideration. After a lot of Pinterest searching, I came across this a woven jean vest. Working on attaching the waistband as the hem. I didn't want a jean vest so I though I make a jean jacket. It was a lot of trial and error as there wasn't a real tutorial to follow. And I was making a jacket just based off a jacket I already owned. I'm not a great sewer especially not back then so it was stretching my skill set.However, it was a forgiving project, and I ended up working on it off and one over several months. The back of my jean jacket. The short version of how to make a jacket like this has lots of old jeans. Cut the jeans into strips, weave the strips into a solid piece for the back. To make the front sew the pieces together. Cut out the sleeves in one piece and soo them on. To finish add a collar and a jean waistband as a hem. The front of my jean jacket. It doesn't have a zipper of buttons just facings along the front. Of course, it was slightly more complicated than that. And it certainly didn't go too smoothly. If you would like to see, more details click here. I love this jacket it very me and also wearable in my daily life. (Sometimes when I sew I get carried away and make things while great they don't get a lot of wear.) I love this jacket, and it is a great addition to my closet. Fabulous, creative and unique - I love it! Looks better than the inspiration piece! You really outdid yourself. Welcome to the community!!! I love your first refashion here. AMAZING! Very inspiring. Looking forward to more of your work. That is amazing! Great make!